Ski trails closed as rain turned snow into slush. Temperatures warmed into the 40s with scattered sunshine Sunday in central Maine after sleet, freezing rain and rain on frozen surfaces had shut down roads and sent cars and trucks sprawling across the region Saturday. 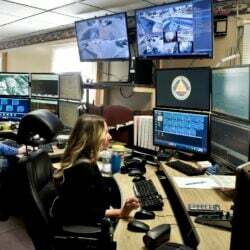 Emergency dispatch centers received reports of property-damage accidents and disabled motor vehicles unable to traverse icy secondary roads all night Saturday and into Sunday morning. The National Weather Service issued a flood watch until 7 p.m. Sunday because of the potential for ice jams on area rivers. By 2 p.m., however, no ice jams had been reported according to the Somerset County Regional Communications Center in Skowhegan. 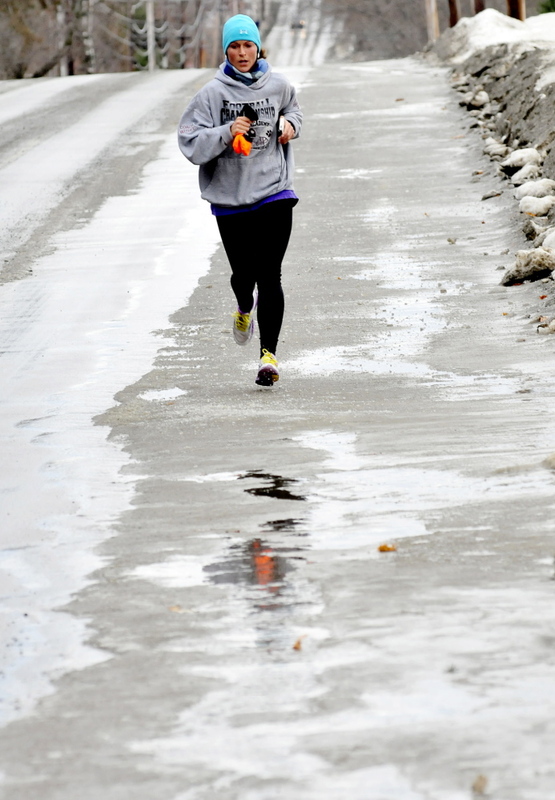 Staff photo by David Leaming SLOPPY RUN: Lindsey Welch runs through slush, water and ice in Waterville on Sunday, Jan. 12, 2104. "Today is not as bad as Saturday except for my wet feet," Welch said. 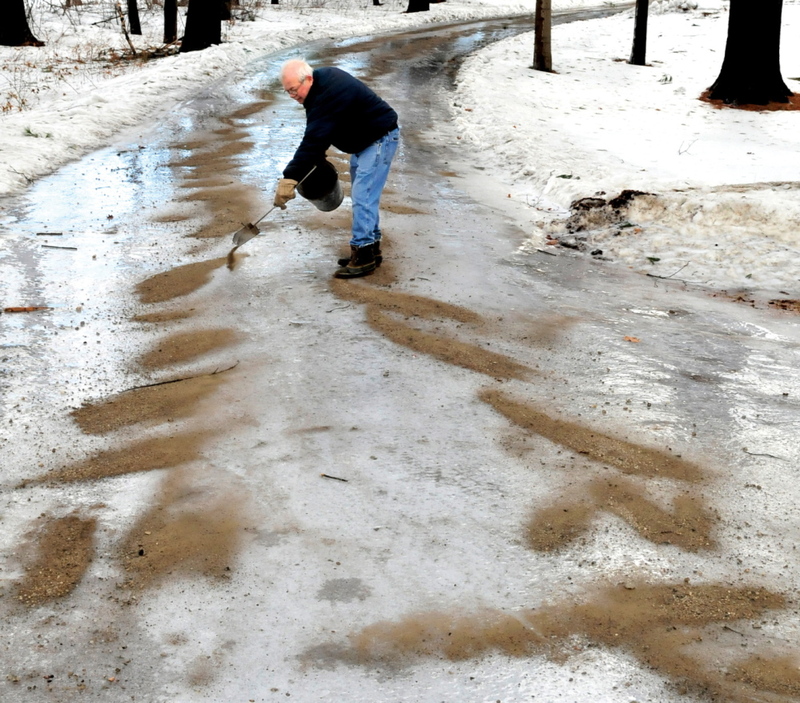 Staff photo by David Leaming GET A GRIP: Lewis Stiilman spreads sand for traction on his steep and ice-covered driveway in Clinton on Sunday, Jan. 12, 2014. It wasn't long before he emptied the bucket and went for more sand. 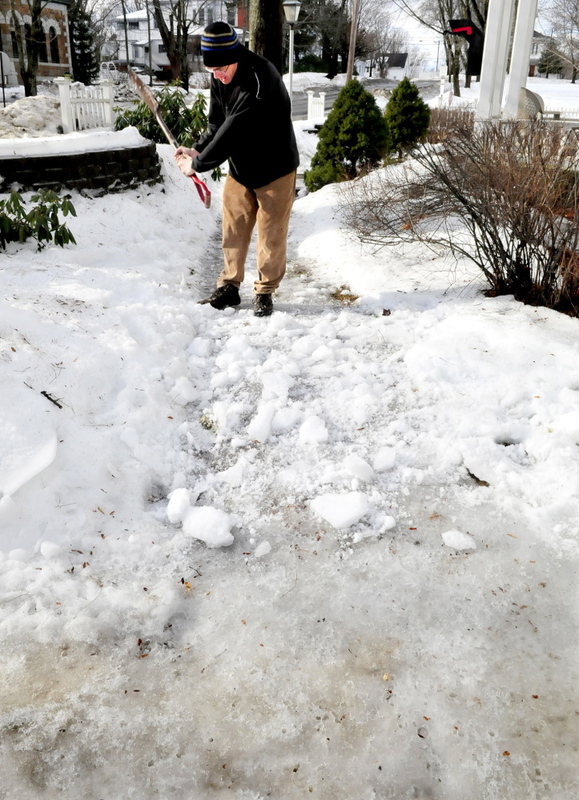 Staff photo by David leaming NICE SWING: Swinging a shovel like a golf club Shawn Zeimetz knocks snow over an ice-covered sidewalk for added traction at a home in Fairfield on Sunday, Jan. 123, 2014. Meteorologist John Carroll at the weather service forecast office in Gray said 0.67 inches of rain fell in Augusta, with 0.90 inches in Farmington. The town of Turner hit the jackpot Saturday, with 1.44 inches of rain reported. 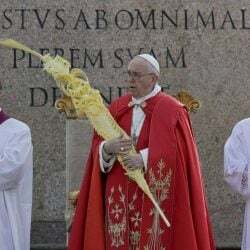 There were no readings for locations in the Waterville-Skowhegan area, he said. The wacky weather also put a dent in outdoor activities with ski areas and snowmobile trails adjusting to slush and water. Sugarloaf Mountain, in Carrabassett Valley, briefly closed all ski lifts Sunday morning because of trail conditions and wind, snowmobile trails had to be groomed in the Bingham area and Eaton Mountain Ski Area in Skowhegan closed entirely because of heavy rain. 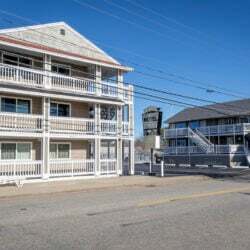 “Lots of snow has been stockpiled, and we’ll be able to recover for next weekend,” Eaton Mountain owner David Beers said on the resort’s website. The snow-tubing hill is expected to be open for business Friday. As of 8 a.m. Sunday, all lifts at Sugarloaf were on hold and the SuperQuad was closed because of high wind, spokesman Ethan Austin said. He said 12 to 15 of the mountain’s 153 trails were open Sunday. Austin said once the temperatures drop back to normal readings for January, mountain crews will be able to start making snow again for a return to ideal conditions. At Saddleback Mountain, in Rangeley, conditions were a little better, with some wind Sunday but not enough to close the ski lifts, marketing director JoAnne Taylor said. She said 22 of the mountain’s 66 trails were open Sunday. Taylor said the open trails generally were holding up well with a deep snow base despite the rain, with loose granular and frozen granular surfaces, but wind moved in Saturday afternoon and the upper mountain was closed to skiing. She said at least 25 trails will be open Monday, with more by next weekend after new snow making. A recorded message Sunday at Saddleback Mountain, in Newry, reported all trails that had been closed were open again. There were 81 open ski trails. Titcomb Mountain, in West Farmington, opened at noon Sunday, with groomed trails in beginner terrain and a couple of more advanced trails. Snowmobile trail conditions were much the same Sunday with trails needing to be groomed because of the rain and warm weather. Monday’s weather forecast from the National Weather Service is for mostly sunny conditions with a high temperature near 42. Snow and rain are predicted for Tuesday and Wednesday, with temperatures near 40 during the day and in the mid-20s overnight.